This popular festival has now become firmly established on the UK’s walking calendar. Whether you are a seasoned walker or just enjoy a stroll there will be something in the programme that appeals. 35 walks and several fringe events aim to showcase the rich heritage and beautiful landscape of the Lower Wye Valley with walks varying in length from 2 - 13 miles led by our local experienced walk leaders & guides who either live or work in the area. There is nothing like local knowledge to take you to places that are less frequented but equally beautiful and interesting. 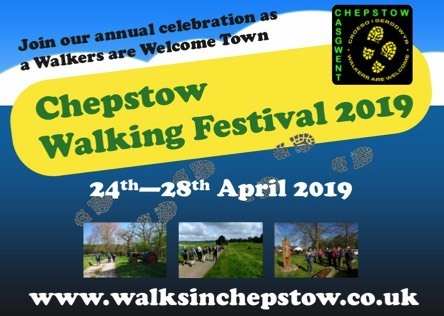 Free parking in Chepstow and transport if applicable is included in the ticket price if applicable to your walk. A Supersaver Ticket of £15 gives you the opportunity to join as many walks as you wish or £5 for a single ticket. Under 16's are free as is the Walk for Health. The full programme, including those in the Tintern area, and how to purchase your tickets can be found online www.walksinchepstow.co.uk or Chepstow Tourist Information Centre 01291 623772 or Chepstow Museum 01291 625981 Book early to guarantee your place.